By 1953, General Electric had already been in business for 75 years, according to this full-page advertisement that ran in the American Radio Relay League's (ARRL) QST magazine. It highlights a few key electronics-related accomplishments by the company since its founder, Thomas Edison, in 1883 built the first electronic tube as the result of a discovery that came to be termed the "Edison effect." 75 Years Old This Month, General Electric Has Written Tube History With a Long Series of "Firsts"! 1883 - First electronic tube was built by Thomas A. Edison, a founder of G. E., in connection with his discovery of what was termed the "Edison effect." 1913 - High-vacuum, high-voltage tube was developed, and work was begun on thoriated filaments. 1915 - G-E tube research, toward modulating h-f for radio voice transmission, resulted in the design and construction of a successful phone transmitter operated from a-c.
1918 - Quantity tube production. 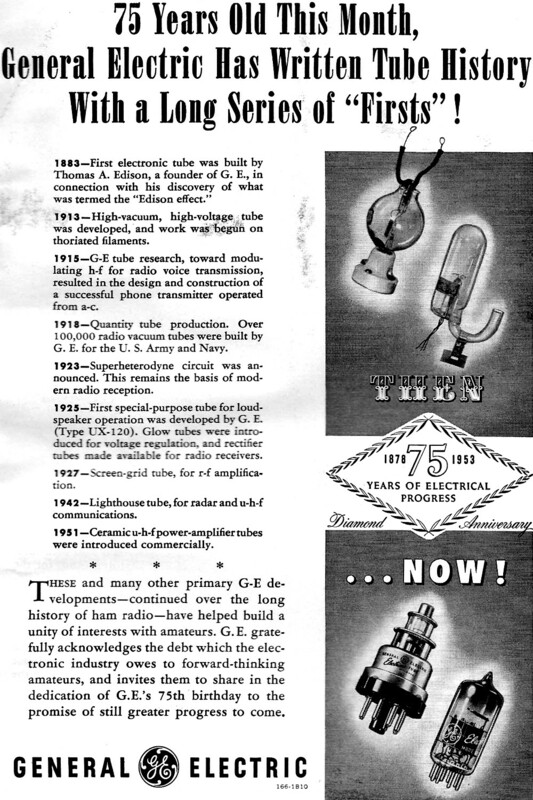 Over 100,000 radio vacuum rubes were built by G. E. for the U. S. Army and Navy. 1923 - Superheterodyne circuit was announced. This remains the basis of modern radio reception. 1925 - First special-purpose tube for loudspeaker operation was developed by G. E. (Type UX-120). Glow tubes were introduced for voltage regulation, and rectifier tubes made for radio receivers. 1927 - Screen-grid tube, for r-f amplification. 1942 - Lighthouse tube, for radar and u-h-f communications. 1951 - Ceramic u-h-f power-amplifier tubes were introduced commercially. 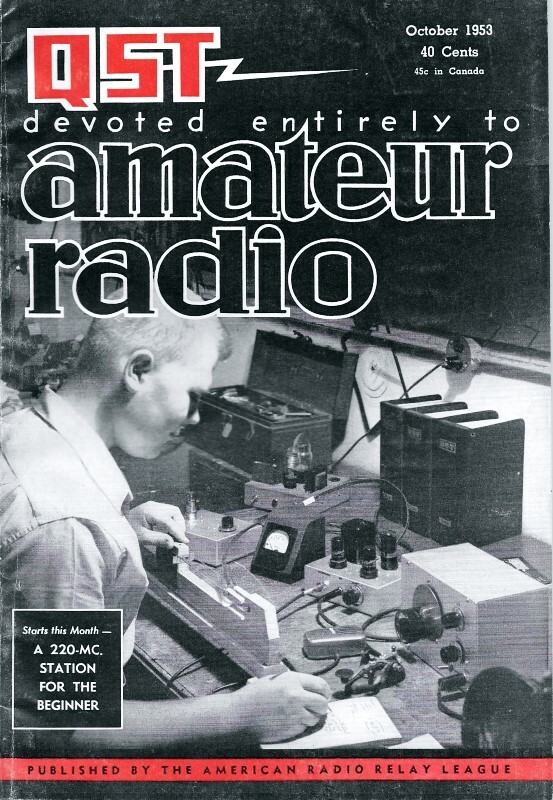 These and many other primary G-E developments - continued over the long history of ham radio - have helped build a unity of interests with amateurs. G. E. gratefully acknowledges the debt which the electronic industry owes to forward-thinking amateurs, and invites them to share in the dedication of G.E. 's 75th birthday to the promise of still greater progress to come.